On December 1 each year, I start listening to my favorite Elvis Christmas album If Every Day Was Like Christmas. Many Christmas compilations with Elvis have come and gone during the years, but this one remains the best. Released in 1994 it includes all the songs from his two original Christmas albums plus a couple of alternate takes. Speaking of alternate Christmas takes, six more of them were released on the excellent FTD album I Sing All Kinds from 2007. Obviously not being overdubbed in any way, they offer a more intimate Christmas feeling than the masters. This is especially true when it comes to "If I Get Home On Christmas Day" that lacks the bombastic arrangement of the original release. I also have to mention the two outtakes of "I'll Be Home On Christmas Day," the best Elvis Christmas song in my opinion. Essential Christmas listening. Not so essential, but controversial, is Elvis Presley Christmas Duets released last year. This Christmas I decided to give it a chance (having only heard audio samples of it on the Internet earlier) and actually bought it yesterday, on Christmas Eve. I have to say that Tygrrius over at The Film Frontier expressed it well when he called Christmas Duets "a bit of a jumbled mess" in his review of the CD. Better then to stick to the original songs. Every Christmas I always play my very first Elvis record. Fittingly enough, it's titled Blue Christmas, and is a RCA LP manufactured in Sweden in 1976. It sports the same cover as Elvis' Christmas Album from 1957 which I admit is both confusing and unimaginative. But it has a pretty good mix of songs taken from Elvis' two oroginal Christmas albums and will always have a special place in my collection. I guess every fan has his or her way of spending Christmas, Elvis style. How do you spend yours? Merry Christmas and Happy New Year! Reading my brother's recent guest blog I was reminded of a similar experience also having to do with an album with a guy singing like Elvis on it (or at least trying to sing like him). This must have been in the early 80's when I wasn't too picky either. The nearest department store had a record sale and when I saw an LP with an oil painting of Elvis gracing the cover I bought it. 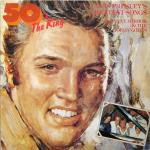 50 X The King featured ten medleys of hits, sung by someone called Danny Mirror together with The Jordanaires. Elvis' famous vocal group I was familiar with but it was not until later I learned that Danny Mirror was a Dutch singer who most fans remember for his 1977 tribute single I Remember Elvis Presley. High praise, indeed. But though Danny Mirror sings with feeling and a few times made me think of Elvis, not once did any of the songs sound better than the originals. Of course. The Jordanaires sounds very much like they did on the originals, though, and the arrangements are pretty similar too. Maybe because Elvis' 60's guitarist Hal Blain plays on the album. The medleys are, at times, cleverly put together. 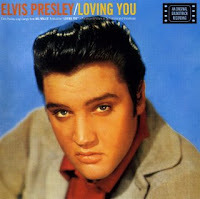 But at the same time the format highlights the difficulty with taking on the task of singing Elvis songs spanning all over his career, as Elvis' voice changed, deepened and matured during the years. It's no easy task singing "My Boy" and then switching to "Love Me Tender," for example. To me it's the medleys with material solely from the 60's that work the best, with songs such as "Kiss Me Quick" and "Devil In Disguise" while the early rock 'n' roll stuff like "Blue Suede Shoes" and "Jailhouse Rock" leaves a lot to be desired. But I have to hand it do Danny Mirror, ending the album with ... yeah, you guessed it, "Danny Boy." One of the first records I ever bought, ladies and gentlemen was ... still, still! Was ... terrible! Nah, it wasn't even a record, but a tape. I guess it wasn't long after I got the Loving You cassette from Thomas that I found a music cassette on sale somewhere, I Can't Stop Loving You, with ... 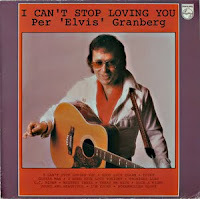 Per 'Elvis' Granberg?! I guess I wasn't too picky in those years, but instead very curious. What's this going to sound like? The cassette contained a range of well known Elvis songs, from "Mystery Train" to "Steamroller Blues," and I remember playing Per Elvis quite a lot on my little tape recorder. "I'm Yours" was the one song I hadn't heard before, by the way. Going through a box of old tapes last week I found Per Elvis again and put it in the machine. It was ... not too bad. Of course he tries to sound like Elvis ("Take it! "), but he does it pretty well and the arrangements of some of the songs are quite nice, especially the ballads which are often done with just a piano. It turns out that Per Elvis (he was from Norway) was already around in the fifties, made some records and then fell into obscurity, returning in the early seventies with live appearances and recording a few albums for the not so small Philips label. And, he even met Elvis, before his matinee show (Elvis's show, that is!) at the Nassau Coliseum on June 24, 1973. Check out the photographs here (Per Elvis is the guy in the blue clothes). Per Elvis sadly died in 1980, at the early age of 38. But his music lives on. I guess. Take it! Today is my youngest brother's birthday. As he's as nuts about Elvis as I am, it's not hard to guess what kind of presents he gets from me. Or whose face is on the greeting card. I'd like to tell you about one particular memory I have from this date many years ago. My guess is it took place in the early 80's when my brother was something like ten years old. As a gift I had bought a cassette with the soundtrack from Loving You on it. This was in the days when a lot of Elvis albums were still "new" to us, in the sense that we had never heard them before, except for the hit songs they included. So I guess I was as excited as I thought my brother was going to be. Unfortunately my brother had to be at school early, so me and the rest of the family had to sing to him and hand him his presents at an ungodly hour. Trying to recollect the moment, I think I just handed over the gift-wrapped cassette, and after seing the happy smile on his face when he realized what it was, returned to bed for some more sleep. The following I remember clearly, though: Turning over in my bed and wrapping my bedclothes around me, I heard the first song from the Loving You album sounding through the walls. Not at all loud, my brother had the volume turned down, but enough for me to hear the first lines, "I got a woman, mean as she can be..."
I don't remember what I did after school that day, but I'm pretty sure me and my brother listend to that cassette tape over and over. That's why I'm doing the same thing right now, enjoying the songs from Loving You and particulary "Mean Woman Blues." Happy birthday, little brother! Last weekend I went to the cellar to fetch a box with Christmas decorations. As I was about to leave my eye was caught by a bag in a corner. All of a sudden I remembered one of the things I had stored in it. 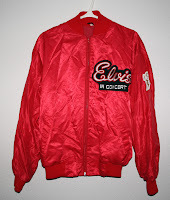 Opening the bag, I rummaged through it a bit until I found what I was looking for - my red Elvis in Concert jacket. Needless to say, I brought it with me along with the Christmas stuff. After some detective work, I found out that I bought the jacket throught the Swedish fan club in 1984. (I located the ad for it in one of the first magazines I received when becoming a member.) My brother also ordered one, and man were we proud of them. The only problem was that it wasn't particulary cool to dig Elvis back then, at least not in my school. It took courage to just wear a badge with Elvis, and the idea of wearing a screaming red jacket with a big Elvis In Concert patch on it... well I was to much of a coward to pull that one off. My brother, a couple of years younger, had more guts. He wore his red jacket to school with pride. I only had mine on a couple of times at home, and then hang it in the closet. There it stayed until college when a friend of mine borrowed it for a party where he pretended to be a boduguard for Elvis. Guess who dressed up as the King? Then the jacket went into storage until I remembered it last weekend. Unfortunately it can't be an original Elvis In Concert jacket as it has no white-striped collar and cuffs, although the patches look like the right thing. But I'm happy I found it.